I've been quite busily working on some Christmas projects (and slipping one little one in for me) over the last while, besides coming down with a nasty cold that has made me a little too tired to take on any big projects in the evenings. 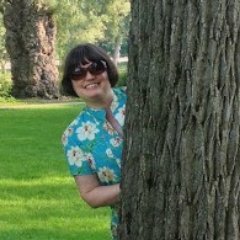 So no new sewing projects to share at the moment, though I'll be sharing a couple of little things later this week. But what I have been doing is reading: that is pretty much a standard for me, and in recent evenings when I've felt it necessary to get into bed early on, some fascinating books have kept me company. I'm very intrigued by the intersection of textile craft (particularly embroidery) and activism, and have been reading through two collections on the topic. 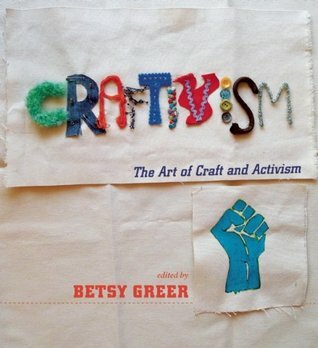 The first, Craftivism: the art of craft and activism, by Betsy Greer, is kind of the start of this genre. Greer apparently is the source of the term, and in this book she highlights many different groups of crafty people who use their craft to social ends. Some are knitters, crocheters, embroiderers, even quilters or mosaic artists. Each has a small essay and some photos of their work, as well as links as to where to find out more. I did find though, that many of the contributors are ephemeral, in the sense that their websites are out of date already, and no longer available. The book is still inspiring, though, and it is lots of fun to ponder other people's clever ideas. The second read is focused more closely on embroidery. 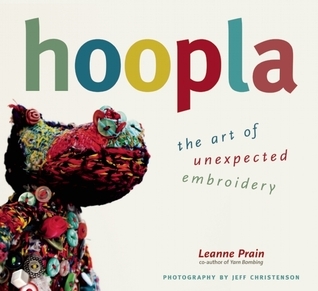 It's called Hoopla: the art of unexpected embroidery, by Leanne Prain, a Canadian writer who has also written books on yarn bombing and storytelling via textiles. It's a huge, heavy book full of photos and essays - much the same format as Greer's book, but longer. It has a variety of craftivists, some which appealed to my aesthetic and some which really didn't. But again, it is interesting to see the variety of craft enthusiasts who are using their chosen method to create something unique. This book is not entirely focused on craftivism, rather, it opens up into crafters who are just choosing to pursue their craft as a kind of lifestyle statement as well. Plus a few textile artists who exhibit professionally. It's an intriguing blend, and made me think about what I want to get out of my own sewing and embroidery practice. I ordered both of these books through my library system to check them out. I usually do this with craft books, in order to see what I need to own for myself. I don't think I'd need either of these in my permanent collection, but they were both very worth reading, and I'm very thankful for my library system's robust interlibrary loan abilities. And now to the one book that started me off on this craft reading jaunt -- a classic book in this field, which I've owned for years and years -- though I ended up reading the newest edition from 2010. 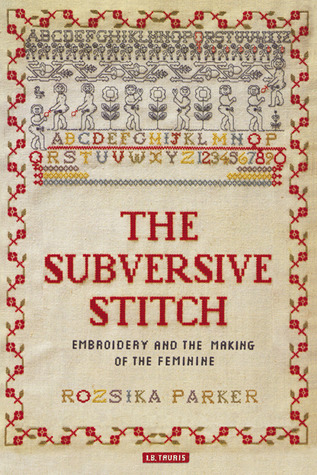 It's Rozsika Parker's The Subversive Stitch: Embroidery & the making of the feminine. It was a great read. Parker is extremely knowledgeable and a very good writer; the history she shares is very readable, not dully academic. This is a chronological approach, dealing with embroidery from the time of the Bayeux Tapestry up until the 70s (when it was first published). The new edition also has some mention of more current embroidery artists, but just a mention. It's also primarily looking at English history. Things I found most interesting were the way that embroidery came to be both tied to the feminine in an oppressive manner, while also allowing a space for the subversion of the title. Originally embroidery was not differentiated from the fine arts; it was only in the Renaissance when art and craft began to split that embroidery turned into a feminine, amateur craft. Parker draws the connections between the ways that patriarchal society used embroidery as a way to define "the feminine", in many different eras. I was particularly taken with the war of words in the 1600's between men who thought that needlework was beneficial because it kept women silent and still, and the women who replied to them by writing their own public tracts in response, mocking the author. Throughout the book, Parker shares both how women were oppressed by needlecraft, and how they spoke up using the same metier. I was really inspired by this one to follow up with our current resurgence of handicraft and activism. Parker's book is a fascinating, feminist history of this art form, and is a must read in this area. 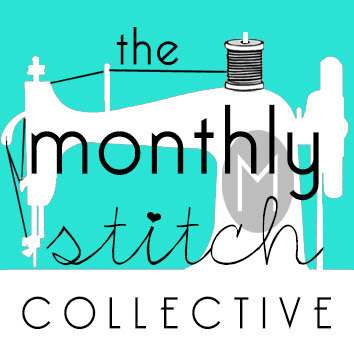 After I'd read it, I also discovered this amazing podcast series from a conference at Goldsmith University in the UK: The Subversive Stitch Revisited: The Politics of Cloth. I've been listening to many of these lectures while sewing and embroidering, and enjoying them in their varied subject areas. Lots of learning going on around here lately. Do you have any must-reads to recommend? Quilts & politics, how fascinating! Yes, I've finally come around to audiobooks -- still not my favourite way of reading, but I am getting used to them while sewing :) Glad to hear that you find them helpful too.